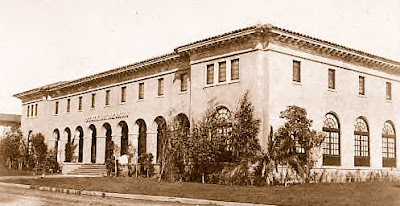 The Nevada State Building was located north of the Lipton Tea Pavilion and Gardens, on the east side of the Panama-California Exposition's Alameda. The commodious structure was designed in a Spanish-Italian style, and featured plain walls, a multi-arched entrance arcade, large arched windows, and a Mission-tile roof. The Nevada State Building was originally intended to be located across from the Utah State Building, on the Via de los Estados. However, due to delays in construction, the Nevada commissioners decided to place the building along the Alameda, to preserve the extensive landscaping already established on the original site by the time construction was set to begin. Comprehensive exhibits from the State of Nevada filled the building's large interior.